Like its washed-out album cover, there is no sunshine on OH/KY; Pinnell's sorrow and redemption are true enough without glossing them over. You want to feel sorry for Jeremy Pinnell. With lines like "I love the needle some / And the needle loves me / It wants nobody / To be free", he doesn't make it easy. The waltzing "Big Bright World" is one of the few upbeat moments on OH/KY, the debut album from the Kentucky native. Residing in the Ohio River valley, country music flows through the divide. 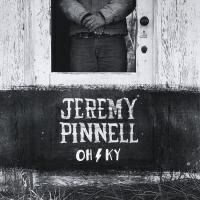 Pinnell pays tribute to the genre's tropes on OH/KY's opener, "The Way Country Sounds". A tutorial on classic country music, Pinnell sets the tone for the album as well as recounting his demons: "You live the life I've lived / You'd know the way country sounds." Backed by Cincinnati players, the 55s, Pinnell saunters through ten country tracks of bad choices ("Loose Women"), restless ambition ("Outlaw Life") and lament ("Light Me Up"). Like its washed-out album cover, there is no sunshine on OH/KY; Pinnell's sorrow and redemption are true enough without glossing them over. With the anodyne of traditional country music, one feels Pinnell might be alright.